Tired of feeling dried out and scratchy after every shave? Ready to ditch razor bumps and irritation? You need to find the best shaving cream for sensitive skin. Lucky for you, we’ve assembled this handy guide showing you some of the best creams on the market for people with sensitive skin. These creams are specifically formulated to keep your skin hydrated and healthy. Check out our specs to see what you should look for in a great shaving cream. Fragrance Free: Fragrances can cause additional irritation in people with especially sensitive skin. Some fragrances will be ok, some will not be. If you don’t have especially sensitive skin, you don’t have to worry about finding something fragrance free. Type: A gel? A cream? What’s best for you? It completely depends on your personal preferences. Some people love the feeling of a rich lather on their face, legs, or head, so a cream is ideal for them. Others prefer gel. Non-Comedogenic: This is just a fancy way to say this formula is specifically made to not clog your pores. This can be especially helpful for people with incredibly sensitive skin, offering their pores a little rest from the harsh chemicals included in many skin care products. Aloe: Aloe has been used for centuries as a soothing agent for skin. So be sure your shaving cream includes aloe. Some creams include other soothing elements like oatmeal, which can work just as well as aloe. Application: Some people like the use of a brush or another instrument to apply their shaving cream. But for many, their hand is a perfectly fine way to apply their shaving cream. It’s totally up to your personal preference. Size: The size is something to consider when buying a shaving cream. How often will you use it? How much do you need? Take these things into account when you purchase a shaving cream. Now that you know what to look for in the best shaving cream reviews, let’s get right to our guide. If you’re looking for the best shaving cream, check out our top pick. It’s the one we consider to be the best of the best. Our budget pick is a great choice for people who want something amazing on a tight budget. We’ve also included eight other picks that will help your sensitive skin feel better after a shave. So let’s get right to it! This English classic is definitely the best shaving cream for brush users. This shaving cream comes in a convenient 5.3-ounce tub that makes it easy to scoop with a brush. This is a great shaving cream for people really looking to get an old-style feel when they shave. It has a light fragrance, so as not to irritate sensitive skin. If you’d prefer something else, this cream also comes in a cedarwood and a natural scent. These options make this cream a great choice for anyone looking for a great shave. This cream allows you to get a great classic shave, every morning. If you don't want to use a brush, you can easily apply this shaving cream with your hand. It looks great on any bathroom countertop and adds to your morning routine. This shaving cream lets you start off your day on the right foot every morning. Our budget pick is a great choice for anyone looking for a shaving cream that is simple and easy to use. It’s original formula dramatically reduces nicks and razor burn, making your morning routine pleasant, not painful. It doesn’t sacrifice quality of shave for this though and give you a close, comfortable shave. It contains unique molecules that allow your razor to glide effortlessly over your skin, this leaves your skin feeling baby smooth every morning. The especially concentrated formula makes this tube last you for 90 days of shaving. It’s made with natural ingredients like Macadamia Seed Oil, Aloe, Calendula Extract, Lemon Extract, Papaya Extract, and Olive Leaf Extract. To top that, this cream is paraben free and not tested on animals, so you won’t feel guilty using it. It comes in three scents, cooling, original, and sandalwood to fit any taste. This shaving cream is a great choice for anyone looking for a superior shave at a low price. This is a great choice for anyone looking for the best shaving cream for acne. This cream with calming chamomile extract makes your skin baby soft, without leaving it prone to acne. It also contains Vitamin E to soothe irritation and keep skin looking healthy, making your skin the best it can be. This shaving cream is free of dyes, which minimizes the risk of irritation. It’s a great choice for anyone who needs something especially baby soft and gentle on their skin. It layers on in an extra thick lather to give you a close, smooth and incredibly comfortable shave. It contains aloe to help you soothe your skin and keep it healthy and soft. It’s formulated with no drying alcohol, to keep your skin from drying out and becoming coarse. It comes with skin guard technology to keep your skin protected with every shave. It cares and protects your skin from redness and blistering. 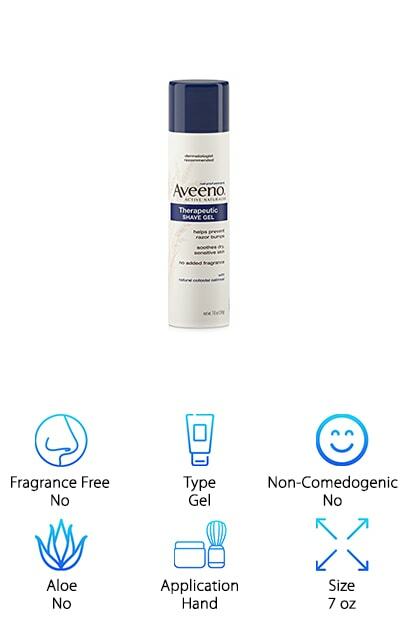 This Aveeno shave gel is a great choice for anyone looking for the best shaving cream for wet electric shaver. It is designed to be used with a wet razor to retain moisture and keep your skin smooth and soft while shaving. This gel comes in a 7-ounce canister, so you'll always have some. This gel helps soothe and protect dry or sensitive skin while you’re shaving. It even helps to prevent razor bumps. This gel contains soothing natural colloidal oatmeal, making it a great choice for people looking for a soothing and natural solution. This shaving gel also contains moisturizing lubricants to help reduce dryness. 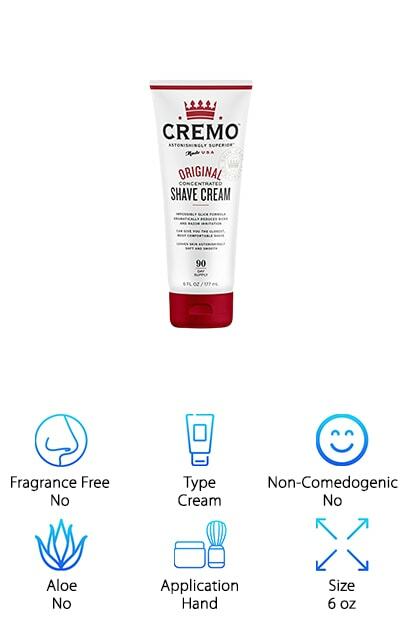 This shaving cream is recommended by dermatologists for people with sensitive skin, so you can be sure that this shaving cream will take care of your skin. This shaving cream contains Aveeno’s active naturals that help to soothe your skin without artificial ingredients. This cream foams up well and is a great addition to your morning routine. This shaving cream is great for men looking for a solution to shaving with sensitive skin. This gentle formula is infused with aloe, allowing it to gently caress your face as you shave. It is soothing and leaves your face soft. This formula even includes lubricating ingredients to help protect you from irritation during shaving, Less irritation= happier you. This formula is a great choice for anyone looking for a great option that works well on sensitive skin and hydrates as it works. It hydrates your skin to soften the hair you are shaving and remove it more easily. The formula also protects your skin as you shave, giving you a great shave every time. This shaving cream has anti-friction gel, which enhances razor glide. Enhanced razor glide allows you to get a closer, smoother, and more comfortable shave. It allows you to have healthy looking skin after every shave. 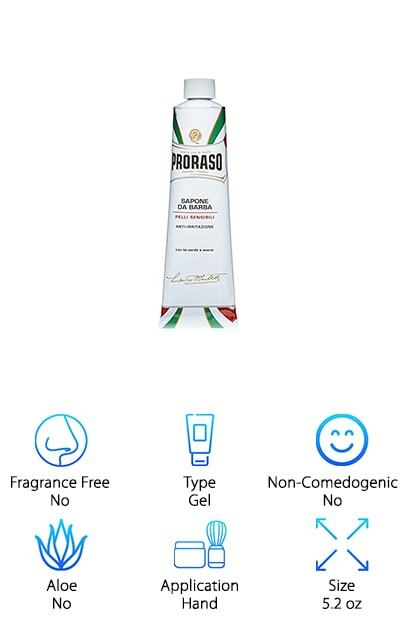 If you’re looking for the best shaving cream, Proraso Shaving Cream is here to save the day. This amazing shaving cream provides a rich and creamy lather that helps your skin prepare for a close shave, even on our head. The oatmeal and green tea in this formula help to soothe and protect inflamed, sensitive skin. This gives even people with incredibly sensitive skin comfortable and close shaves. The scent is refreshing and light. It features a bit of lime and apple, leaving you feeling fruity and refreshing. You don’t need a lot of this amazing gel either. Just use a dime-sized amount and work it into a rich lather. This helps prepare your skin for a great shave every time. Proraso is a classic name in shaving, helping men achieve a smooth shave since 1948. This cream is made with nourishing botanical extracts and natural oils. These help to protect the skin not only during shaving but before and after as well. 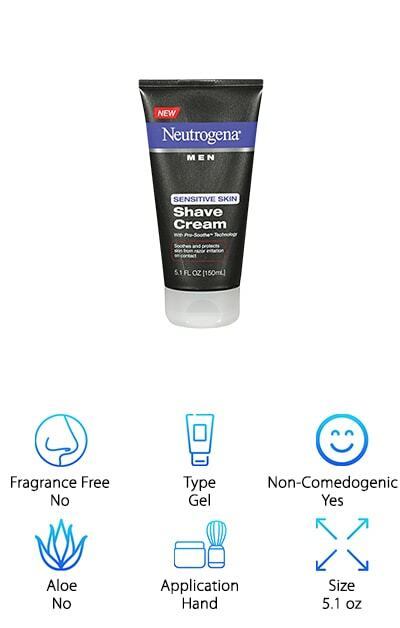 This is a great shaving cream for anyone looking for something from skincare giant Neutrogena. This 5.1-ounce bottle of shave cream packs a serious punch for those looking for something to soothe their sensitive and finicky skin. This cream helps soothe and protect against razor burn and irritation. This formula is oil-free, so it won’t further clog your pores. It is also dye-free and clean rinsing, meaning you won’t have any problems using it, even on especially sensitive skin. It comes with Neutrogena’s Pro-Soothe Technology, which helps fight against razor bumps and ingrown hair. This non-comedogenic formula won’t clog pores, leaving you with luminous and radiant skin after every shave. This is an especially great formula for men, as daily shaving can leave your skin feeling raw and sensitive. This cream provides a rich and luxurious lather, leaving you feeling refreshed and calm after every shave. This is a great choice for men who need something soothing for their skin. 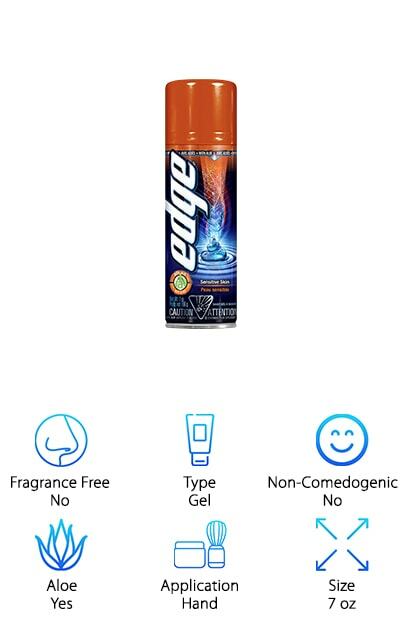 The Edge Shave Gel for Men has been lauded as the best head shaving cream. This is a great option for people who need something soothing and easy on their skin for constantly shaving everything from head to legs. This formula contains aloe, which allows it to help soothe your skin as you shave. This also makes it non-irritating on sensitive skin. This formula moisturizes and provides excellent razor glide, even along sensitive or bumpy skin. 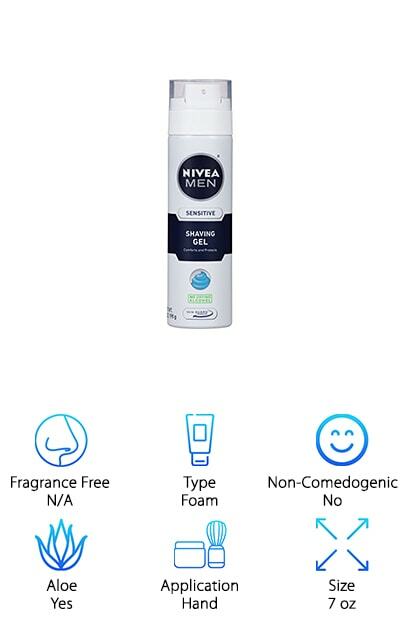 It contains cooling conditioners that leave your face feeling refreshed. This solution allows you to get a close and comfortable shave every time, as it contains lubricants that help your razor glide easily over your skin. This razor is a great choice for people looking for an amazing and classic shave gel that people have sworn by for years. This formula allows you to shave comfortably and moisturizes your skin with aloe as you shave. 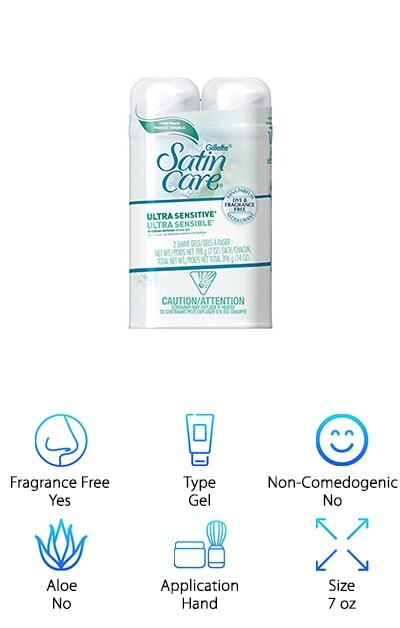 If you’re looking for the best shaving cream for legs, look no further than Gillette Satin Care Shave Gel. It is a great choice for women looking for something soothing for their legs. It is dermatologist recommended for sensitive skin, so you know it won’t harm or irritate your already sensitive skin. It is even free of dyes and fragrances. These things can potentially irritate your skin and cause harmful or painful irritation. This formula also improves razor glide, allowing you to easily get a clean and close shave every time. This is a great choice for people with dry or sensitive skin that needs some extra love. 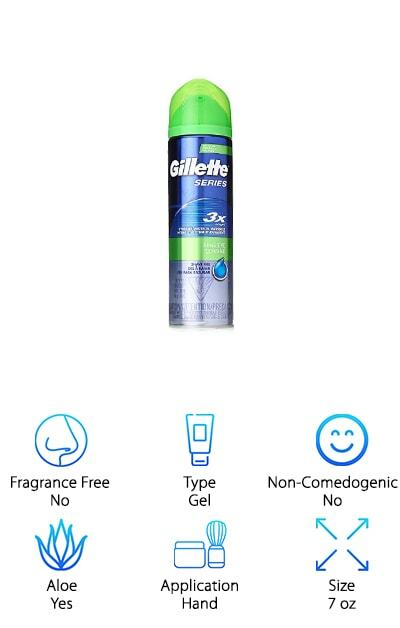 It is also a great choice for people who shave frequently, as frequent shaving can irritate your skin and leave your with annoying razor bumps. This shaving cream can help prevent that and leave your skin looking as soft and smooth as when you started. Looking for the best shaving cream for safety razor? Kiss my face! But really, this Kiss My Face Shaving Cream is the answer to all of your prayers. Its moisturizing properties are truly remarkable. 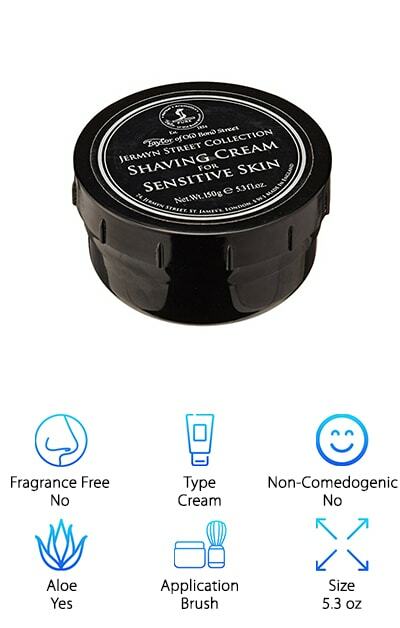 This cream provides a unique four in one formula, which provides a clean shave. It softens, smoothes, soothes, and moisturizes your skin as you shave, leaving you with baby soft and happy skin. This shaving cream includes olive oil, coconut oil, goldenseal, lemongrass, and aloe vera. These ingredients help soothe and moisturize your skin while you shave, plus they smell amazing! Every ingredient in this product is deeply thought out, leaving you with the feeling that someone is truly caring for your skin when you use this cream. The Goldenseal protects against nicks and scratches, the Lady's Mantle acts as an astringent, and the cooling peppermint acts as an antiseptic and stimulant. This formula nourishes your skin naturally and effectively, making it a great choice.